The Ariel Store and Tavern was host to an annual party celebrating the Cooper case, and this party began in November 1974, three years after the hijacking. At that time it was being sponsored by a previous owner of the store with some success, but Cooper Days went international after a lady named Dona Elliott purchased the store in the late 1980’s and spiced things up a bit. She added hundreds of Cooper-related items to the store’s walls and ceilings, and started serving her famous (and cheap) stew to party-goers. Attendance increased so much that people often spilled into the parking lot. The famous sign, which is still in the original location near the store today. She and her son Bryan Woodruff took the annual party to the next level, and pretty soon people were showing up for the event not only from the Northwest USA, but from all around the world. Many visitors would plan vacations in November around the date of the Cooper Days festival, and some said they had the greatest time of their lives. In short, it was a big hit that included live music, and was the most important event staged all year in Ariel. Unfortunately, it all came to a sudden stop when Dona died in late 2015. After she passed away, her licenses to operate the Ariel General Store and Tavern were pulled by both the state and county authorities. They refused to ‘grandfather’ the licenses over to her son Bryan, and the tavern/store was out of business. Bryan was willed the entire property and wanted desperately to re-open for business, but the list of repairs that came down from the state and county agencies were extensive – and EXPENSIVE. They wanted improvements, and refused to issue new licenses without them. 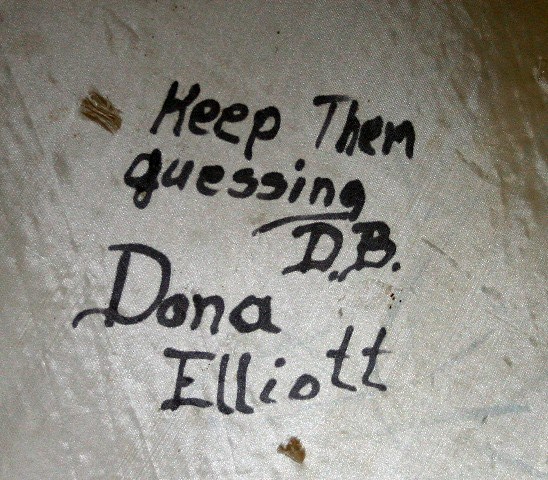 The late, great Dona Elliott signs a parachute. It still hangs from the ceiling of the Ariel Store, along with hundreds of other signatures by people who have attended Cooper Days. In April of 2016, the staff of Adventure Books of Seattle contacted Bryan and offered to sponsor one final party at the store. This writer had attended two previous Cooper Days parties, so we figured it was time to step up and try to help Bryan out with a party that would also be a fundraiser for the store. The object was to assist him in making certain repairs to the store that would enable him to meet current building codes and get licensed. We met with Bryan the same month and discussed our plan with him and took some promotional pictures. Bryan Woodruff, center, promotional picture from April 2016. We then launched a Fund-Me project, but had little success. I decided an auction, as well as just asking attendees to make straight donations was the way to go. And instead of having the party in November, we suggested that because we would have to hold this event outside, instead of INSIDE the store, (no licenses) it should be held in August when the weather was generally good. Bryan agreed to this plan and over the next few months we worked closely with him on it. In the end, everyone had a good time but we were not able to meet goals as well as we wanted. Total attendance ran to about 300 people, if you count the ones coming and going from early morning and into the late evening. The auction only raised about $2,500 in cash, plus some additional money through credit/debit card donations. But this was far short of what Bryan needed to do the repairs. The Ariel Store was first built in 1929, and sits on a severe slope. Both Bryan and I did a complete inspection of the building from top to bottom, and my estimate to meet codes ran about $100,000, perhaps more. We actually got the Travel Channel show Expedition Unknown to shoot some segments during the party itself for their DB Cooper episode, coverage in a couple of local papers, and some other promotional items, but it just wasn’t enough. Two years later, the store still sits as it has for a long time. The hundreds of DB Cooper items draped and posted up around the store remain. Bryan Woodruff is still there and has been known to allow visitors, although he mostly uses the place as his personal residence now. He continues to work on the property a piece at a time and hopes someday to reopen. But the hard truth is that he needs extensive help (and funding) to make that happen. It’s been sad for Cooper fans. Sure, it’s been suggested that another Cooper Days festival could be held in another location in the Northwest. There is the famous sign, the history, the hundreds of photographs, articles, and other Cooper memorabilia that includes a parachute hung from the ceiling and signed by Dona Elliott herself. She also owned the largest known collection of D.B. Cooper-related books, which were displayed at the very last festival. Will it ever reopen? Probably NOT. But someone else has stepped up and wants to move the annual Cooper Days party to a location in Vancouver, WA. He has the resources, and seems perfect for the job. Details coming soon in a future article.